Swift blocks are an increasingly common way of providing callback type behavior to asynchronous functions. Swift 4.2 introduced an interesting change recently, but first let's take a step back and review what "capturing" means. Due to the mechanics of memory management, if we need access to local variable within that block, it must be captured. The Swift compiler automatically manages this for you. dog will be captured (thus increasing its retain count) and you can ensure that even though the dog instance falls out of the current scope, the block is still retaining it. Sometimes you don't want this behavior. The most common reason why is the case where you need to call a method on self inside the block. 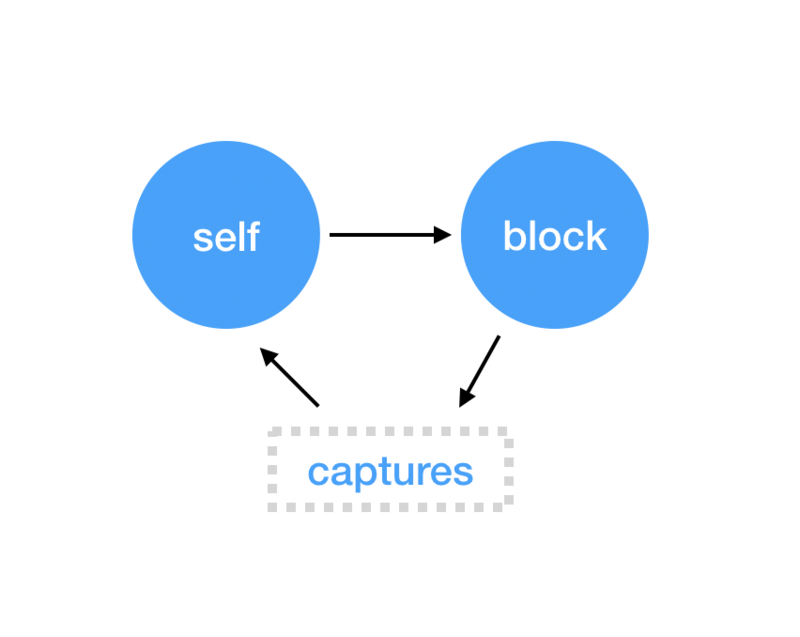 The block will retain self and you've just created a bi-directional dependency graph, otherwise known as a retain cycle. This is bad because it means self can't ever be released as long as the block lives. Often times the blocks are stored as properties on the instance, or as observers for KVO or notifications, and their lifetime is bound to self. If you've done this, congratulations... you have a memory leak. By declaring a capture as weak, you're telling the block to "nil-out" this reference if the original is released. If you need to guarantee that the items in the block execute you can create a new strong reference inside the block. For instance the variable became nil while the block was executing, preventing some of the behavior from executing. In the above example, we ensure that our strongSelf reference exists for the scope of the block. This method is fairly common in Swift projects, but always felt a little odd. however this has been noted as a compiler bug and you should probably avoid using it, as it can change in a future release. Ok, back to the title of this post. I also think lines like the above would be incredibly puzzling for someone brand new to the language. That said, I do think the syntax is a lot cleaner, and I'll probably start using this in my projects. Side Mirror 2.1 was released to the Mac App Store with support for Dark Mode on macOS Mojave. I'm teaming up with my friend Joe Cieplinski (fellow musician and app developer) to build an app for guitarists. We're documenting our journey in a new podcast.